My inspiration for making soup is often a convergence of too many vegetables in the refrigerator with homemade stock and leftovers from a roast chicken. This recipe is not an authentic tortilla soup, as I managed to empty most of the contents of my veggie drawer into it. It’s chock-a-block full of corn, zucchini and peppers, purchased at the farmers market, along with the requisite garlic and onion. Season and spice the soup to your taste. Ideally it should have a little heat, but since our family is divided on what constitutes “spicy”, I pass a bottle of hot sauce around the table so everyone can fire up the soup to their taste. This soup is meant to be thick. More chicken stock may be added for a soupier consistency. Serves 4 to 6. Heat the oil in a soup pot over medium heat. Add the onion and sauté until softened, 2 to 3 minutes. Add the peppers and sauté until crisp tender, about 2 minutes. Stir in the garlic and zucchini and sauté briefly, 1 minute. Add the chicken stock, plum tomatoes with juice, tomato paste, cumin, coriander, salt, pepper, cayenne, and cloves. Bring to a boil, then reduce the heat and simmer, partially covered, 20 minutes. Stir in the chicken, corn, and beans. Partially cover and simmer until thoroughly heated through. Taste for seasoning. 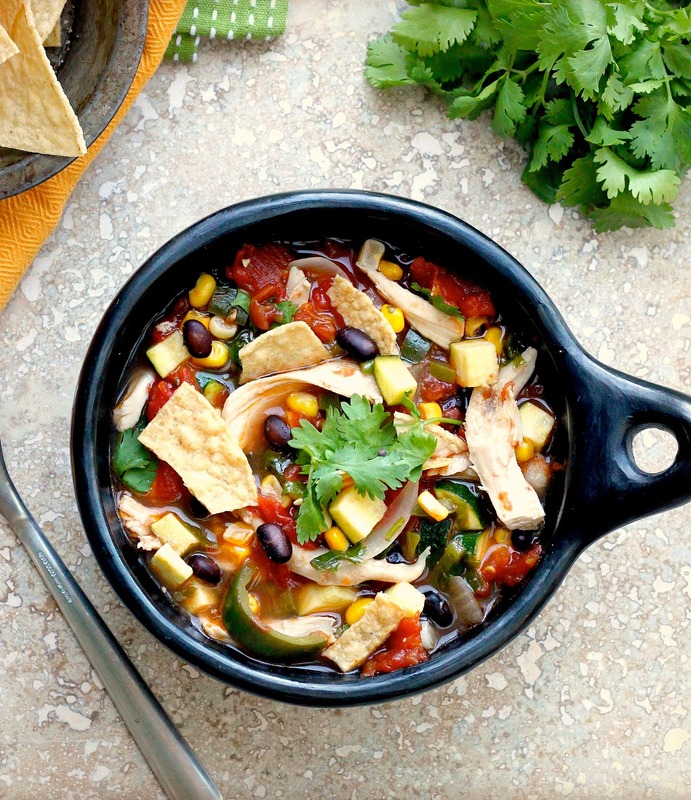 Stir in the cilantro leaves and serve warm, garnished with the tortilla chips. 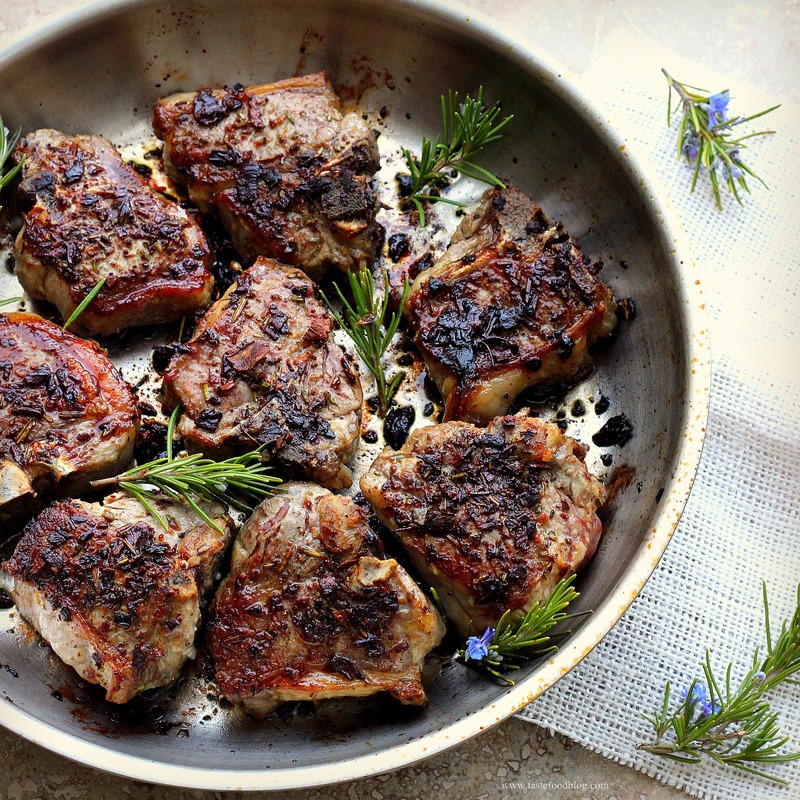 A rub of crushed dried porcini mushrooms and finely chopped rosemary creates an umami-rich crust for lamb. I use a food processor to blitz the mushrooms before continuing to chop them by hand with the rosemary, resulting in a coarse rub. A spice grinder will create a finer crust. Preheat the oven to 375°F (190°C). Heat 1 tablespoon oil over medium-high heat in a large ovenproof skillet. 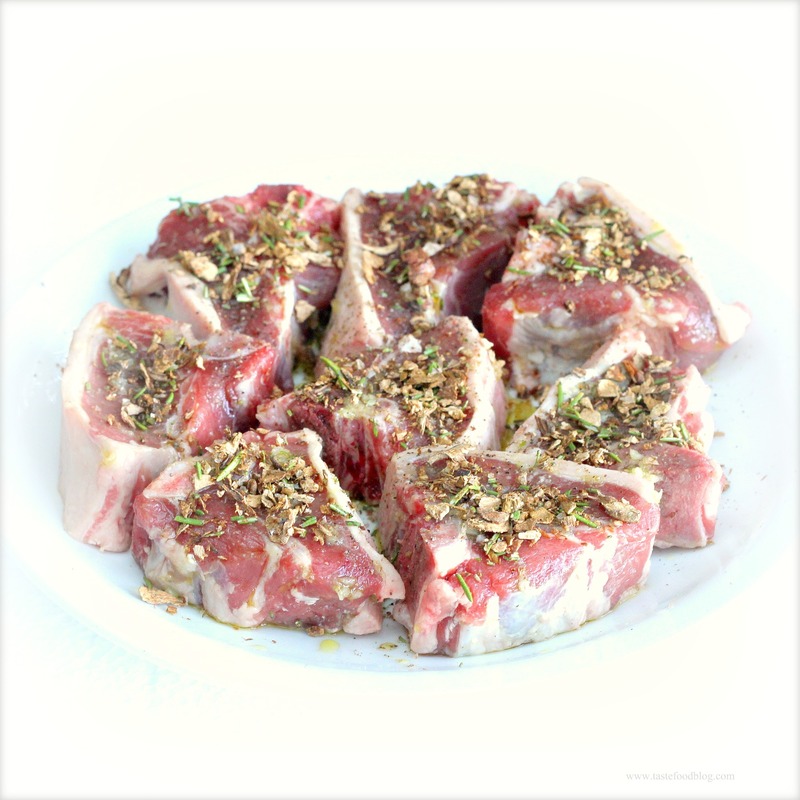 Add the lamb to the pan without overcrowding. Cook until brown on both sides, 3 to 4 minutes per side. Transfer the skillet to oven. Bake until cooked to your desired doneness, about 10 minutes for medium-rare. Remove from the oven, tent with foil, and let rest 15 minutes before serving. The busier I get, the more I crave simplicity. And the busier I get, the more elusive simplicity becomes. It’s time to take charge. While I might not be able to simplify my calendar or clear my work load with the snap of my fingers, and how I wish I could simplify my clothes closet and garage storage with a Bewitching wiggle of my nose – I can at least simplify my dinner. In fact, simple dinners are often the best. Minimal, fresh and light, composed in less than 30 minutes, these dinners do not skimp on flavor, and offer require double portions, because they taste so good. Many Italian recipes fall into this category. This recipe takes inspiration from Cacio e Pepe, the humble Roman dish consisting of pasta, olive oil, cheese and cracked pepper, glistening with reserved pasta water. Of course, since I can at best call myself a sometimes-simplifier, I couldn’t resist throwing in a few more ingredients for good measure. No one will argue with bacon, is my bet. I used spaghetti, because that’s what I had on hand. Bucatini or gemelli would work well, too. Serves 4. Heat a skillet over medium-high heat. Add the bacon and fry until crisp and golden. Transfer to a plate lined with a paper towel. Pour off all but 1 tablespoon bacon fat from the skillet. Add the breadcrumbs, salt and black pepper. Toast over medium heat until golden, about 1 minute. Transfer to a bowl to cool, then add 1/4 cup Parmigiano and stir to blend. Bring a large pot of salted water to a rolling boil. Cook the pasta 1 minute less than package instructions for al dente. Scoop out and reserve 1 cup cooking water and drain the pasta. Heat the oil in a deep skillet over medium heat. Add the garlic and chili flakes and saute until aromatic, about 30 seconds. Add 1/2 cup reserved water, the pasta, 1/2 cup Parmesan and the Pecorino to the pan, stirring and tossing constantly to melt the cheese and evenly coat the pasta. (If too thick, add additional water a little at a time to reach desired consistency). Remove from heat. Add the bacon, half of the breadcrumbs, and the arugula; toss to warm through. Serve immediately with remaining breadcrumbs sprinkled over the pasta. In our multi-national family with previous addresses in 4 countries, we’ve adopted a hodge-podge of cultural traditions that we call our own when it comes to Christmas. In Danish style, we celebrate with a big dinner on the 24th, when we light live candles on our Christmas tree. The meal often includes duck and beef, surrounded by French favorites such as Pommes Dauphinoise and a climactic Buche de Noel. The 25th is decidedly more low key, perhaps with a foray into Chinatown for dim sum, or a lazy day of leftovers, smoked salmon and cheese. Luckily there is always some duck left over from the night before, which I stash in the back of the refrigerator for a more Asian inspired meal on the 26th or 27th. 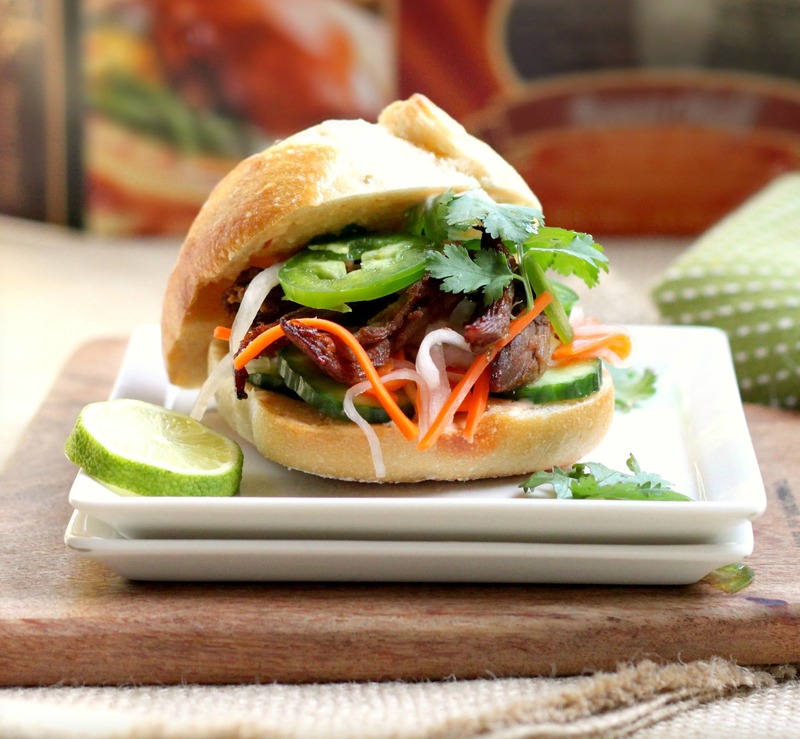 Duck reheats beautifully with a little help from some of it’s rendered fat, and when shredded it’s happily reinvented into spicy lettuce cups – or banh mi. These sliders are a firework of flavors and sensations. Shredded duck coated with a sweet and salty Sriracha glaze and crisped in the oven until caramelized is layered with creamy garlicky aioli, piquant veggie slaw, fresh cucumber and jalapeno heat. Here’s a recipe where you can use up any shredded duck meat, and if you don’t have any leftover duck lurking in your refrigerator, purchase duck legs confit and shred those for a luxurious step. Place the carrot and daikon in a bowl. Sprinkle the sugar and salt over the vegetables, then rub with your fingertips until vegetables soften, about 1 minute. Add the vinegar and lime juice and stir to combine. Let stand at room temperature for 30 minutes. Whisk all of the ingredients in a small bowl. Chill until use. Preheat the oven to 450°F. Place the duck in a small baking dish. Whisk the soy sauce, sugar, oil, Sriracha and coriander in a small bowl. Pour over the duck and mix to thoroughly coat. Bake in the top third of the oven until crisp and caramelized in parts, about 10 minutes, stirring once or twice. Spread 1 to 2 teaspoons aioli on bottom bun half. Top with a layer of cucumber and then a mound of the carrot and daikon slaw. Top the slaw with shredded duck. Arrange jalapeno slices over the duck and top with cilantro sprigs. Spread another teaspoon of aioli on the top bun half. Repeat with remaining buns. Serve with lime wedges. Everything tastes better on a stick. 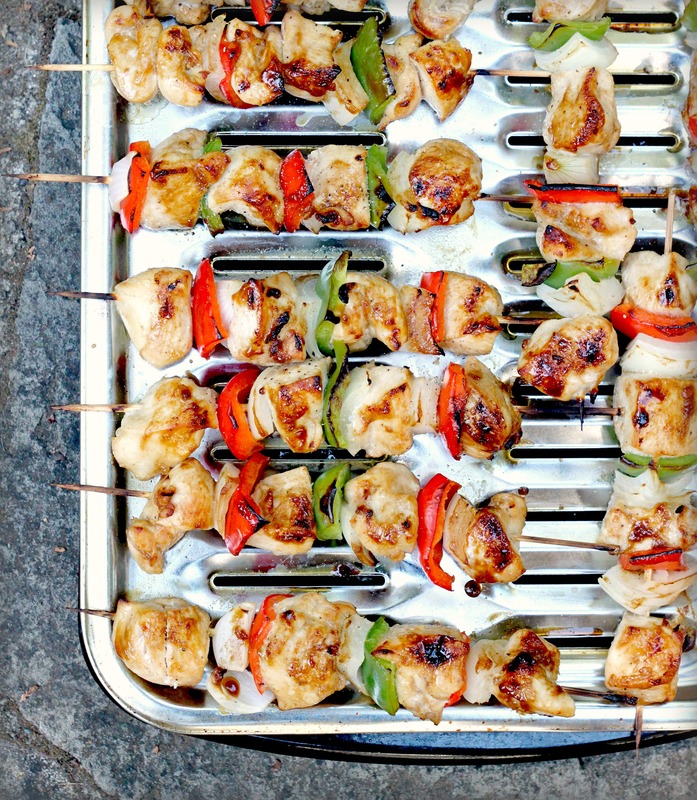 Skewered chicken, peppers and onions are a simple healthy and quick dinner that the whole family will enjoy and have fun eating. These skewers pack extra flavor with a marinade enriched with sweet and piquant pomegranate molasses. The sugars in the molasses help the chicken brown and crisp while grilling. If you have the time, marinate the chicken in the refrigerator for up to 6 hours. If not, then simply let the chicken marinate at room temperature while you prepare the vegetables and soak the skewers. Pomegranate molasses may be found in the international aisle of most supermarkets. Whisk the marinade ingredients in a bowl. Set aside 1/3 cup for basting. Lightly season the chicken pieces with salt and black pepper. Place in a large bowl and pour the remaining marinade over and stir to coat. Cover and refrigerate for up to 6 hours (or let stand at room temperature for 30 minutes). Prepare the grill for direct cooking over medium heat or preheat the oven broiler. Thread the chicken on the skewers, alternating with onions and peppers. Grill or broil until sides exposed to heat source are golden brown, 4 to 5 minutes. Turn and baste with reserved marinade. Continue to grill until the other side is golden brown, and the chicken is thoroughly cooked through, 4 to 5 minutes. Serve warm. 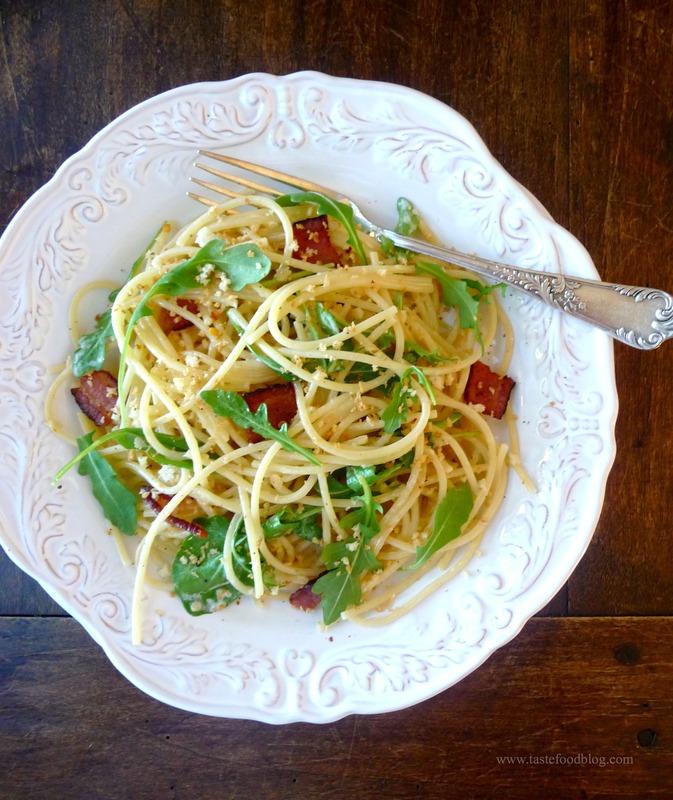 I know it’s summer, but sometimes a nice meaty pasta dish just hits the spot. 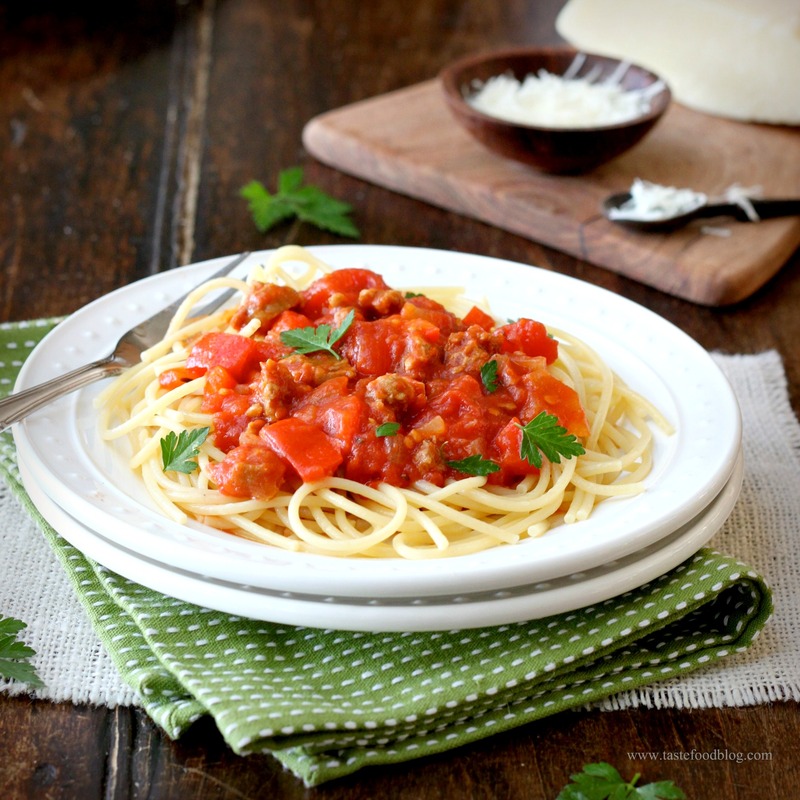 I’ve lightened up this ragout by adding fresh grape tomatoes to the sauce. As the sauce simmers, the tomatoes will begin to break down adding garden-fresh brightness to this satisfying dinner. Heat olive oil in a skillet over medium heat. Add sausage and sauté until golden. Transfer with a slotted spoon to a plate lined with a paper towel. Discard all but 1 tablespoon fat in the pan. Add tomatoes, red pepper, garlic, oregano and chili flakes. Sauté 2 minutes. Add the wine. Bring to a boil and simmer until the liquid is reduced by half. Add the plum tomatoes, tomato paste, bay leaf, salt and pepper. Cover and simmer 30 minutes. Taste for seasoning. If needed, add sugar. While the sauce is simmering, bring a large pot of salted water to a rolling boil. Add spaghetti and cook until al dente. Drain. Serve hot with the sauce spooned over. Garnish with cheese and parsley. Last week I came home from the farmers’ market with an armful of mustard. I shop with my eyes and couldn’t resist the bunches of mizuna mustard leaves – frizzy purple, spiky red, scalloped green – not to mention their sunny flowers strung together in tidy bouquets. Since then, they’ve made themselves at home in my fridge, while I’ve reached for pinches and handfuls at each meal, tossing in salads, sprinkling as garnish. Yesterday was our last hurrah. 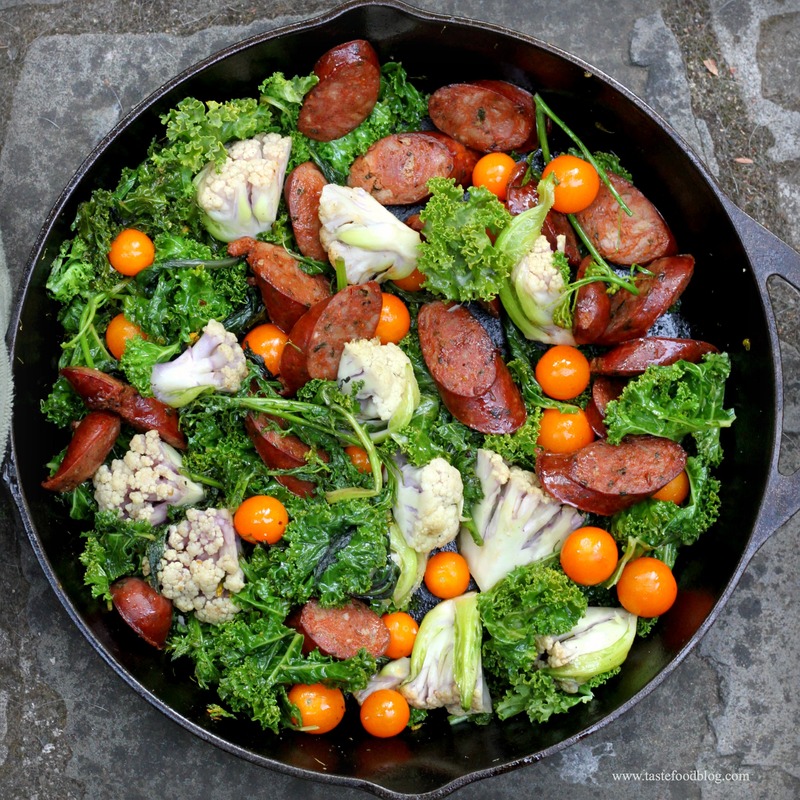 I up-ended the remaining mustard into this quick one-dish skillet dinner, along with my other market acquisitions: spicy Italian sausages, violet-tinged baby cauliflower, orange cherry tomatoes and a few handfuls of curly kale for good measure. Heat 1 tablespoon oil in a large skillet over medium-high heat. Add the sausage in one layer and cook until golden brown on both sides, turning once. With a slotted spoon transfer to a plate lined with a paper towel. If the skillet is dry, add 1 more tablespoon oil. Add the cauliflower and a sprinkle of salt; sauté until crisp tender, about 2 minutes. Add 1 tablespoon oil, garlic and red pepper flakes. Sauté until fragrant, about 30 seconds. Add the greens, 1/2 teaspoon salt, cumin, paprika and black pepper. Saute until the greens are tender and bright in color, about 2 minutes. Add the tomatoes and sausage. Cover partially, reduce heat to medium-low and cook until heated through, about 5 minutes. Taste for seasoning. Serve warm with couscous or farro.